Your business blog is one of the most powerful tools in your toolbox. But how do you know that your lean, mean lead generation machine (aka your business blog) is running as efficiently as possible? 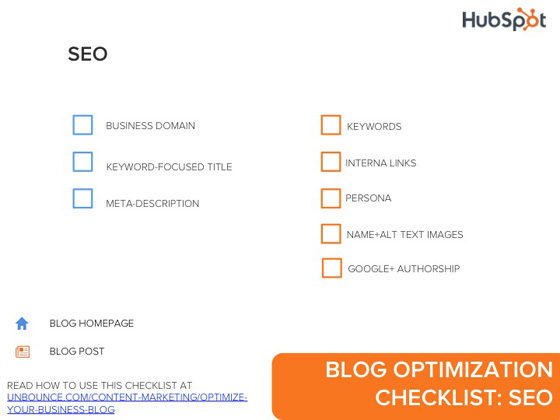 We’ve created a master checklist of everything your blog should be optimizing for and how to do it. Seem overwhelming? Don’t worry! This post will act as a step-by-step guide for everything you need to know. If you have questions, we’re happy to address them in the comments section. Let’s break it down. Navigation to primary business pages: Even if the user is just browsing educational content on the blog, make it easy for her to learn more about your company and products/services by including navigation to primary business pages. Content grouping: Now that you have visitors, encourage them to stay a while! Make it easy to browse the available content by grouping by topic, skill level and or content type (video, infographic , blog post etc.). Search box: Let users find exactly what content they’re looking for by including a search box on the sidebar. Subscription options: Encourage readers to follow your content by including a way to subscribe to your content via email or RSS. Post previews: Let viewers skim your content by previewing posts in parts. Make the preview extra clickable by including an image. Each blog post should include five features in addition to the content itself. Call-to-Actions (CTAs): Don’t worry–we’ll talk more about optimizing CTAs in a second. In the meantime, make sure every blog post includes at least one content and one product-focused CTA. These can be at the beginning or end of the post, sidebar or links within the copy itself. Images: Don’t let your blog post become a wall of text–include at least one image to make it more readable. Here’s everything a marketer needs to know about creating visual content to get you started. Load time < 2 seconds: The average online shopper expects a page to load in two seconds or less, and after three seconds, up to 40% will abandon your website according to Gomez. Check to make sure your post loads in less than 2 seconds using free tools like Yslow. You’ve probably thought a lot about optimizing your blog for your target audience, but what about for search engines? Optimizing your business blog for SEO can be intimidating – that’s why we’ve created a step-by-step on-page SEO template to helping you plan out your strategy. Here’s what you need to be thinking about for your blog domain and posts. First things first, here’s how to optimize your primary blog domain. Integrate blog with primary business page domain: Host your blog within your primary domain (ex. Company.com/blog or blog.company.com). instead of hosting your blog externally (ex. company.wordpress.com or company.blogspot.com). Don’t cannibalize SEO authority by having two domains compete against each other. Pick a keyword-focused page title: Instead of calling your blog “Company’s Blog”, why not take advantage of a keyword opportunity? Since search engines put more emphasis on words closer to the left, name your blog’s page title something that focuses on keywords first, then your company name, to gain authority for those keywords. Add a meta-description for search engines. A meta-description is a summary of your webpage for search engines. Make sure your blog has one (with keywords!) so that searchers will know what your blog is about. Here’s everything you need to know about meta-descriptions. Optimize posts for keywords: Keywords are the words searchers use to find your site—so they’re pretty important! Make sure to include (but not stuff!) keywords in your post title, header tag, image text, copy, and meta description. Include internal links: You should navigate to other content in your blog structure, but don’t forget about linking to relevant content within the post itself. Include internal links, or those to pages within your domain, with strategic anchor text to help readers find more content and rank for keywords. Write for your persona: Every blog post you write should have a target audience in mind. Not sure who that is? Here’s how to create a buyer persona. Name and include alt text for images. Google is pretty smart, but it can’t read images yet. That’s why it’s important to name images strategically (not blogpost1.jpg) before uploading them to your post. Don’t forget alt text in case your image doesn’t show up for the user! Read more on the how-tos of SEO for images. Enable Google Authorship for better SERP results. You know how some google search results page (SERP) include a thumbnail picture of the author on the side? Those results come from Google+ Authorship and they’re significantly more clickable than regular old links. Here’s how to set up Google+ for your business blog. Calls-to-action, or CTAs, are essential for your business blog’s conversion path. After all, they lead readers to landing pages! But why spend time on CTAs — isn’t it really just a button? Yes, but the last thing you’d want to do is lose valuable conversion opportunities to something as trivial as a button misplacement, poor coloring or copy. There are lots of ways you can optimize your CTAs—in fact, we’ve compiled 20 do’s-and-don’t’s for creating clickable CTAs. Once you’ve optimized your CTAs however, it’s important to make sure they’re actually working within the context of your blog. Here’s your checklist for making sure you get the most bang for your buck—er, CTAs. 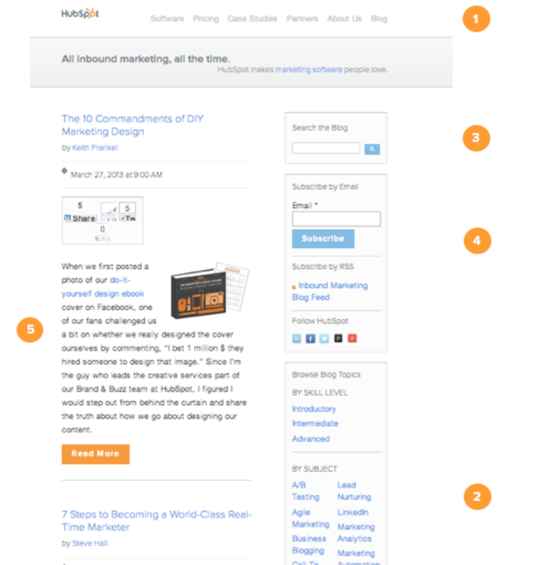 For the blog homepage, try testing at least one CTA related to the content or product. Some blog visitors will enjoy knowing what you offer right off the bat, so this is an opportunity you don’t want to miss. However, you don’t want to be pushy and alienate readers, so use your blog post CTAs as a benchmark to see how the ones on the homepage are performing. If the homepage CTAs are doing better than average, try A/B testing the right placement and copy for your blog homepage CTA. As for the blog posts themselves, here are some good rules of thumb. Update older content with current CTAs. Just because your post is older doesn’t mean it should link to an old offer. Update more evergreen content with current CTAs to increase conversion. Include CTAs in your copy as internal links. CTAs don’t have to be buttons; include links to landing pages within your content itself. Match CTAs to content. If your post is about apples, don’t link to an offer about oranges. Make sure your CTAs are relevant to the content you post. A/B test everything. From copy, color and placement, there are a million ways you can test the effectiveness of your CTAs’ performance—here is Unbounce’s guide to A/B testing for inspiration. 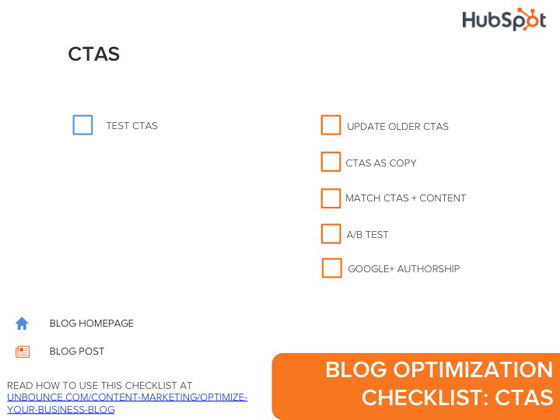 Here’s, you guessed it, a mini-checklist just for blog homepage and post optimization for CTAs. Every marketer wants people to share her content far and wide on the web, but is your business blog optimized for social media? Here’s how to tell if your blogging homepage and posts are doing all they can to amplify your reach. 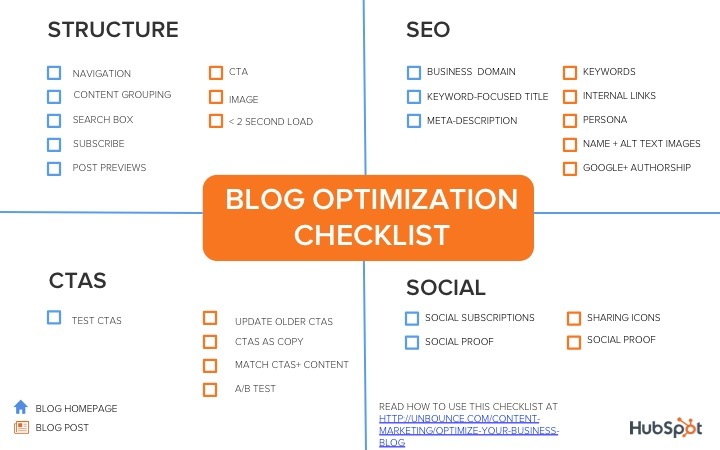 Start by optimizing your blogging homepage for social with these tips. Include social subscription options. Give readers the option to follow your blog on the social network of their choice. This extra step will encourage interaction on social media, not just the blog itself. Showcase social proof. Social proof is the idea that people are motivated by other’s actions. Encourage social interaction on your business blog by displaying social proof—whether it’s a livefeed of what people are tweeting at your blog account or a display to show the number of followers you have per network. These principles also apply to individual posts. Use icons to enable one-click social sharing. Make it as easy as possible for readers to share posts with their networks by including sharing icons. Display social proof. The same concept of social proof is relevant here—people are more likely to share what they believe others are sharing. Include a social media share count on each individual post as well. 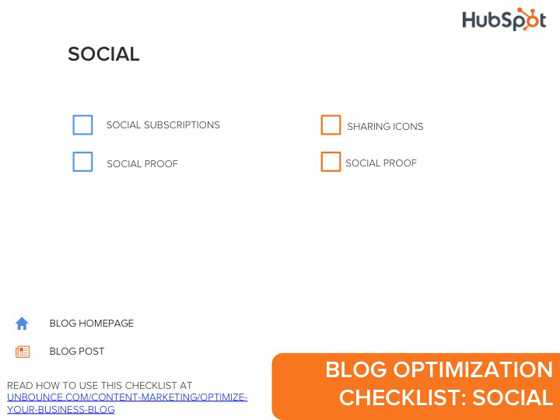 For good measure, here’s a quick checklist of how to optimize for social. Whew, that’s a lot of optimizing! How is it possible to keep all that in mind for every blog post? Never fear, fellow marketer. 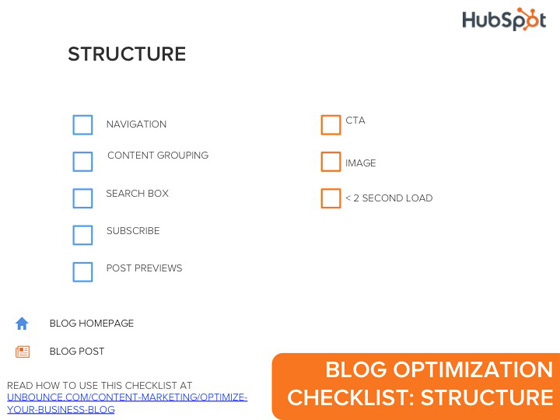 This master checklist at the beginning of the post has everything you need to be optimizing for structure, SEO, CTAs and social—all on one easy-to-print image. Feel free to share it on social or download the pdf directly for your own use. Enjoy!